Tax form print and mail, Tax Printing Services, Tax document processing in Chicago, Portland, Miami and Phoenix. Digital Data Centers processed and delivered millions tax documents last tax season alone for various financial institutions and accounting services. Some organizations provided PDF documents ready for print, while others provided data in standard IRS record format which DDC has already developed software for. Our services and processes ensure fast turnaround to meet IRS deadlines while saving our client money by mailing at the best possible postage rate. The bar code technology has a specific job to do. The bar code located in the middle of the document confirms the page count, set identity, and any special inserting instructions. 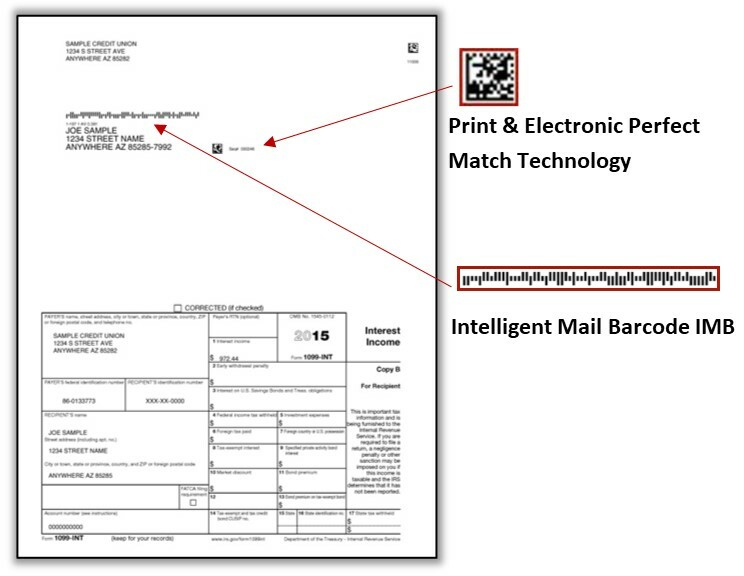 The bar code at the top right confirms envelope sequence and mail piece integrity. A near real-time tracking of tax documents recording the processing facility, operation number and processing date and time. The barcode answers the question of when your mail piece was sent for delivery to the recipient. Request a brochure on our Tax Form printing. Quite often, letters from the document provider need to accompany a tax form, DDC can also provide that service and insert additional material into the correspondence. Envelopes used are lined with a security tint increase the level of security. 1099, in99INT, 1098, 1099MISC, 1099-A, 1099-C or whatever the document, Digital Data Centers can do the job. Let your customers access their tax documents 24/7, 365 days/year with our electronic archive solution, eArchive. eArchive allows you to electronically store tax documents, as many as you need for as long as you need. Your customers can download or print the documents as needed.